Hatteras Yachts have established a reputation for building yachts capable of withstanding punishing seas but, in the recreational marine business, its name has become synonymous with high-quality fiberglass motor yachts and sport fishing boats.﻿ Our convertible yachts offers the perfect blend of sun and shade for any mood you're in. Our boats are extremely safe, seaworthy vessels designed with a vintage style, but built like a tank. 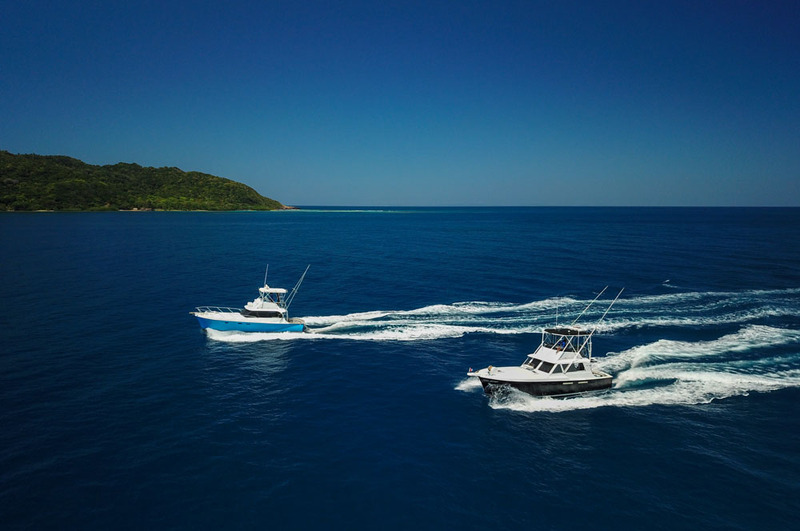 Ruthless and Reel Action absolutely love to have fun and show their guests a great time catching fish, cruising the clear blue Caribbean waters and seeing the best sunsets. See what makes the Hatteras boats of Ruthless Roatan Charters special. My husband and I operate a Charter service in the States so we know great service when we experience it. And Ruthless delivers. The boat itself is beautifully maintained and incredibly comfortable. We especially enjoyed their knowledge of the whole area. And how gracious they were in sharing it. We have been running charters out of Ruthless since 2012 and when we made the decision to add a second boat, we knew it had to be another Hatteras. And so our search began for another Hatteras yacht that offered the dependability, style and comfort that we love. For three years we looked high and low. We had a few close calls, but never the second boat that was meant to be ours. Until one day, Reel Action stumbled into our lives. As we did some research into her past, it was then we discovered through the serial numbers that there was literally only one other boat that was created on the production line between Ruthless and Reel Action. To us this was the closest thing to a twin boat we could have encountered! They were built practically side by side and after a thorough inspection, she became part of our family. Both of these vessels were manufactured at the Hatteras facility in High Port, North Carolina in 1966. Their cost when they were originally put up for sale was in the area of $65,000. Hatteras became the only boat company building solid fiberglass boats from the stringers up, and back then, the knowledge of the strength of fiberglass was not tested over time, so their hull is very thick and much heavier than the boats you see today, which is a real asset in their ability to handle rough seas and maintain incredible structural integrity as they have over the years. She was commissioned in New Orleans in March of 1967. Her first name was Serenity. She was powered with 440 Chrysler gas engines, and then repowered in 1977 with Johnson & Towers 8V53 Detroit’s. She was repossessed in the early 80’s and sat in a boat yard for 5 years prior to auctioning off. Her home port became Freeport TX, where she had a new paint job in 1987. Believed to have had the name, "Hatt’s off" at this time. The prior ownership purchased her as she was sitting at Clearlake Marina under cover for 18 years and the owner never took her out (due to his age)... just let the engine run at the dock and bottom job every 3 years. Her name then became Hatt-A-Tude. She was repowered again in 2006-7, new Cummins 450 HP 6CTA's, along with new ZF gears, new Ray-marine electronics (GPS, Depth & Fish Finder, Radar, Autopilot), new shafts, cutlass bearings, props, Canvas and aluminum tower. At that time they stripped the bottom, added new bearer coat and bottom paint. During this same time she was given a new water heater, 2 new A/C units and a 8KW diesel generator set. The prior owner fished her in the Gulf out of Galveston, prior to moving her to Roatan in June of 2009. While in Roatan, she was fished and used for island hopping, and enjoyed an active life until her owner passed away suddenly, which is how she found her way to us, beginning in 2012. After sitting untouched for a long time she was in bad shape and needed a lot of love and attention. She received new decks forward and aft, a lot of fiberglass work, paint, a complete makeover inside, new rose wood countertops, and eventually she was brought back to a being a wonderful and happy boat again. After a full makeover this vintage boat was renamed Ruthless, and she now stays busy showing vacationers the time of their life on Roatan and beyond! Questions about our boats and if they are right for you, please send us a note.